The ability to acquire new skills through the 'true imitation' of others' behaviour is thought to be unique to humans and advanced primates, such as chimpanzees. Scientists draw an important distinction between imitation and emulation when studying the cognitive abilities of animals. In true imitation, the individual 'copying' another's behaviour not only mimics what they see, but also understands the intention behind the action. In emulation, an animal copies a behaviour without understanding its deeper significance: for example, a parrot reciting the words of its owner. 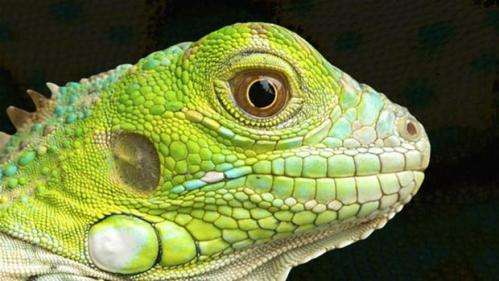 All subjects successfully copied the actions of the demonstrator lizard, suggesting for the first time that reptiles exhibit social learning through imitation equivalent to that observed in 'higher' species. Lead researcher Dr Anna Wilkinson from the School of Life Sciences, University of Lincoln, UK, said: "The ability to learn through imitation is thought to be the pinnacle of social learning and long considered a distinctive characteristic of humans. However, nothing is known about these abilities in reptiles. This research suggests that the bearded dragon is capable of social learning that cannot be explained by simple mechanisms - such as an individual being drawn to a certain location because they observed another in that location or through observational learning. The finding is not compatible with the claim that only humans, and to a lesser extent great apes, are able to imitate." One lizard was trained to act as a 'demonstrator', opening a wire door which covered a hole in a wooden board. The door could be moved horizontally along sliding rails to left or right by use of the head or the foot. The demonstrator was then rewarded with food (a mealworm) on the other side of the door. Dr Wilkinson concluded: "This, together with differences in behaviour between experimental and control groups, suggests that learning by imitation is likely to be based on ancient mechanisms. These results reveal the first evidence of imitation in a reptile species and suggest that reptiles can use social information to learn through imitation." The more we do research, the more we should be saying, "it was surprising higher learning was not observed in species X. Further research is required to tease out the exact mechanisms leading to this abnormal behaviour." And also, I am a huge stickler for language but in science you must be, each word has a specific usage that makes ideas clear to others but also to minimize biases like, "The ability to acquire new skills through the 'true imitation' of others' behaviour is thought to be unique to humans and advanced primates, such as chimpanzees." This should be changed to "... behaviour is thought to be unique to hominids and other primates, such as chimpanzees and humans." Humanism is a bias, and can lead to erroneous conclusions. # Jaeherys - Well said. Cockatoos, ravens, and New Caledonian crows have all been shown to have behaviors that were once thought to be "unique to primates"; social leaning and cued learning are two. Yes you are absolutely right! Silly me in forgetting such an important fact. The more I learn, the more I have started to think that most animals, to some extent, think in similar ways. Their perception of the world may be different and these large differences in perception may produce unique behaviors. An example of this would be mental or neurological disorders which can completely change a person and how the think and behave, e.g. unfortunately positioned gliomas. This is just a hunch but I'd think animals are more similar than different. Any cell/molecular biologist, or geneticist can attest to this obvious fact. Perhaps I'm just hopeful, but at this point there's no reason to assume this may not be possible! The irony is much of the humanism that blinds so many researchers to animal intelligence outside of our own is that they have religious roots. Even scientists who are absolutely atheist will express views that are clearly a reflection of the religiously rooted bias you speak about. While they might claim they consider religious notions about the superiority of man, and man being given dominion over the Earth just religious nonsense, that doesn't cover the fact that within Western culture those notions have become part of the culture, part of a large body of beliefs about what animals can or cannot do most of which had never been tested, but merely assumed to be true. Thus as we finally get around to testing these once thought obvious truths, we find them lacking. OK, we've proved that reptiles can learn. Now can we apply this to fundies and deniers? I have observed cross species learning/ imitation to this extent amongst animals like ducks learning by imitating dogs. and even kangaroos learning tricks by imitating geese. I guess if you haven't seen it your haven't looked. I didn't know it was supposed to be restricted to higher primates so thought nothing strange about it. I think any animal can learn to do things by observing. I will preface that though - some animals are a lot dimmer than others.